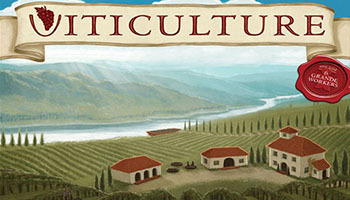 Viticulture is a worker-placement strategy game. Old Tuscany awaits your winemaking skill and Strategic cunning. You''ll plant vines, harvest grapes, age "wines, and Jill merchant orders to create the greatest winery in Italy! When a player plays a summer or winter visitor card, the action described on the card is taken immediately and the card is discarded, ending any bonuses granted by that card. Visitor cards are played by placing a worker on the play summer/winter visitor card action spaces. No additional worker is required to take the action described on the card. Sometimes getting your gaming group together is hard, but that doesn't mean that you can't play Viticulture. These rules provides rules for playing Viticulture solitaire against an artificial opponent called the "Automa". Have more victory points (VPs) than the Automa at the end of the game, which consists of 7 years. Set up your own vineyard as usual. Choose a player color for the Automa and place that VP marker on the win space on the victory point track. Place 1 glass token on each row of the wake-up chart. Shuffle the Automa deck and place it next to the wake-up chart. Remove any visitor cards that only give you a benefit if another player takes an action. Alternatively you can keep them in the deck and just redraw when you draw one of them. A dashed oval where a single worker can be placed. Workers can only be placed in the current season, and each worker can only be placed once a year. Some action spaces are private- they are on your player mats or on structures you've built. Only you can place workers on your private action spaces.